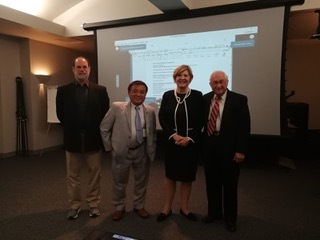 Mike Rosen, Business Architecture Guild, Andy Chen, IEEE, Jean Gehring President and John Zachman at FEAPO annual meeting. The Federation of Enterprise Architecture Professional Organizations, FEAPO, a collective of 15 global professional and standards associations, held the annual conference at the IEEE Headquarters in Los Alamitos, CA. John Zachman, early pioneer of Enterprise Architecture, was joined by Dr. Brian Cameron, IST College at Penn State speaking on how Enterprise Architecture is transitioning in both the technology and academia. They provided a unique lens on the changes occurring in the profession and the unintended consequences.